“Mother Hicks is a witch, people say” is the opening line of Goshen College’s fall mainstage production. 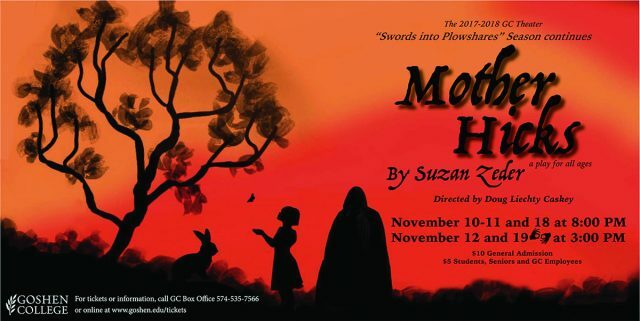 Written by Suzan Zeder, “Mother Hicks” is a play about three individuals: a deaf boy, an unnamed abandoned girl taken in by the town of Ware and Mother Hicks, who is an ex-midwife suspected of witchcraft by superstitious townsfolk ever since the babies she delivered died of scarlet fever. Set during the Great Depression, “Mother Hicks” is told through poetry and sign language. The play explores themes of family, peacemaking and how hatred can develop toward people we perceive as different. If audience members do not speak American Sign Language (ASL), it is not a problem. Most scenes are spoken and all the lines in ASL are interpreted by other characters. Two performances of “Mother Hicks” will also feature full ASL interpretation. Collaboration with the ASL department was one factor that pushed the Goshen College theater department to choose “Mother Hicks” as the fall mainstage, according to director Doug Caskey. The play was also chosen for its relevance to the theater’s theme for the season, “Swords into Plowshares,” as the play explores how to create peaceful outcomes from turbulent situations. In addition, this performance will be the second of Zeder’s works to be produced on the Umble stage. Her play “Step on a Crack” was performed in 2007. “We decided it was time to produce a play like this again,” said Caskey. The cast and crew of “Mother Hicks” have been working on perfecting the show for months now. When asked about their emotions leading up to opening night, the cast and crew said that they cannot believe that it has come so fast and are excited to show off their hard work. Olivia Smucker, a sophomore and the production’s hair and makeup designer, said her favorite part of the show was a haunting poem about the townsfolk’s fear of Mother Hicks. It is performed in sign language by the deaf character and interpreted by the rest of the cast at the beginning of the play. The poem is then repeated at the end to parallel the beginning. All the poetry used throughout the show has a haunting effect, as does the sign language used to communicate the poems. Goshen College students will perform “Mother Hicks” in the Umble Center at 8 p.m. on Nov. 10, 11, and 18. Showings with full ASL interpretation will occur at 3 p.m. on Nov. 12 and 19. Tickets are $10 general admission and $5 for students/seniors/faculty. All performances are eligible for convocation credit. Tickets can be purchased in advance at www.goshen.edu/tickets, by email at boxoffice@goshen.edu or by calling 574-535-7566. They can also be purchased directly from the Umble Center box office one hour before each show. “Mother Hicks” is a play for all ages.